Terrill Welch. On Edge At Cape Bear PEI. 28″x24″. $3300. Elena Maslova-Levin. On Edge In Santa Cruz. 20″×16″. $1620. This two-artist exhibition can be viewed at Terrill Welch Gallery from Friday, April 13, 2018 to Sunday, May 6, 2018. The gallery is located at 478 Village Bay Rd in Miners Bay, Mayne Island, B.C., Canada. It is open Friday, Saturday, Sunday and holiday Mondays 11 – 4. Elena Maslova-Levin will be there for the opening weekend, on Friday, April 13 and Saturday, April 14. We will open the show with an informal conversation about painting and paintings at 11AM, April 13. Please come and take part in the conversation! You can also join as virtually: the conversation will be on FB live at Terrill Welch’s Art Page. The catalogue of the exhibition is available at Amazon. Apart from the paintings, it includes several excerpts of our conversations on art, and life, and an artist’s experience in the world. To preview all paintings on view, please click here. 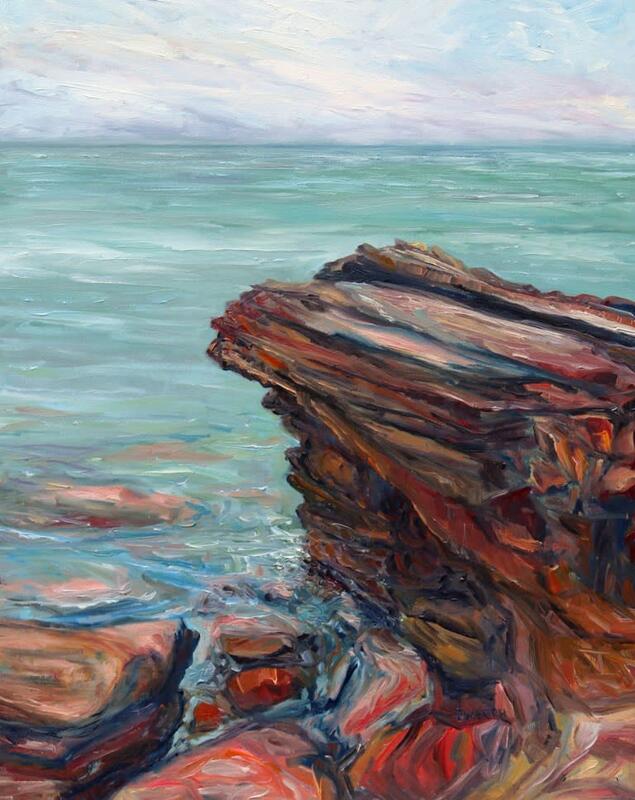 British Columbia artist Terrill Welch’s quick sure painting strokes capture forest, sandstone, sea and sky. They remind us that there is only one moment – this one. There are few impressionist painters nowadays in whom the original creative impulse of Impressionism is so alive and powerful as in Terrill Welch — the sheer joy and grace of moment-to-moment fluid interconnectedness, beyond the bounds of conventional “reality”, filled with light, and colour, and space. 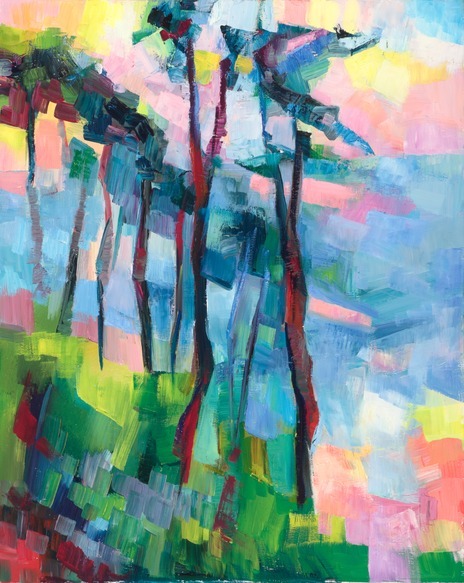 California artist Elena (Lena) Maslova-Levin‘s bold colour and powerful geometry emerge out of synergy between painting and poetry, past and future, moment-to-moment impressions and timelessness of art. Through sheer strength of her observation, the abstraction in Elena Maslova-Levin’s work is as much poetry as it is painting. There is a fullness on the canvas that goes far beyond what we see, connecting us to more than what we thought we knew. Plein air painting is my practice of presence, of being truly alive in the here and now. I stand in awe before the paradox of the ever-present fleetingness of life and its profound timelessness. The landscapes are a celebration of this paradox.